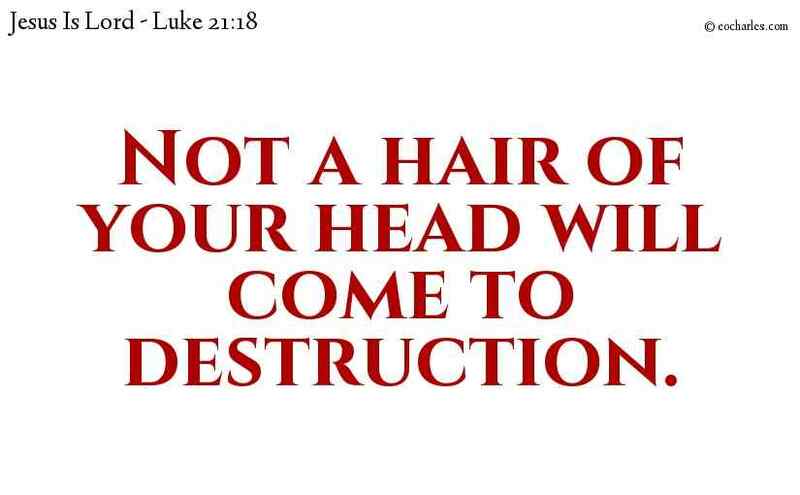 But not a hair of your head will come to destruction. Luk 21:7 And they said to him, Master, when will these things be? and what sign will there be when these events are to take place? Luk 21:8 And he said, Take care that you are not tricked: for a number of people will come in my name, saying, I am he; and, The time is near: do not go after them. Luk 21:9 And when news of wars and troubled times comes to your ears, have no fear; for these things have to be, but the end will not be now. Luk 21:17 And you will be hated by all men, because of me. Luk 21:18 But not a hair of your head will come to destruction. Luk 21:19 By going through all these things, you will keep your lives. Luk 21:26 Men’s strength will go from them in fear and in waiting for the things which are coming on the earth; for the powers of the heavens will be moved. Luk 21:27 And then they will see the Son of man coming in a cloud, with power and great glory. Luk 21:33 Heaven and earth will come to an end, but my words will not come to an end. Luk 21:37 And every day he was teaching in the Temple and every night he went out to the mountain which is named the Mountain of Olives to take his rest. Luk 21:38 And all the people came early in the morning to give ear to his words in the Temple. Next Next post: Have No Fear, Jesus Is With You.